Business is personal and your time is valuable. I appreciate you coming to my website to see how I might be able to help you. My passion and mission is helping you in Mastering the World... Your World! in the areas that are most critical to your success. I personally work with CEO’s, entrepreneurs, sales professionals, HR directors, V.P.’s of sales, and business owners to create positive lasting results. I deliver energized, intelligent, relevant and engaging keynote speeches on sales, leadership, employee motivation and personal development. I also provide one-to-one executive and sales coaching. My goal is to provide you with tremendous value first and then exceed your expectations. Watch my video and see if my energy and personality resonate with you. If they do, let’s have a conversation to see if I can help you manifest the results you are looking to achieve. 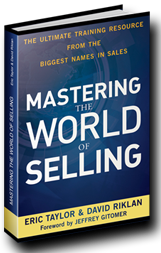 My Mastering the World book series and more than 25 years of business experience have afforded me the opportunity to develop personal relationships with some of the brightest minds in business and in life…if I can’t help you, I know someone who can.